This month’s Recipe Redux theme is “Spring Cleaning” utilizing a forgotten ingredient in your fridge, pantry, freezer, etc. that’s been hanging out for a while. I have a lot of abandoned ingredients, because I often buy items with a recipe in mind and then totally forget what I purchased it for in the first place. I’ve made promises to myself that I’m going to have a week where I ONLY buy the essentials and use up all of the miscellaneous food items already in the house. This NEVER happens. I cook according to my taste buds, so I always end up picking up recipe ingredients that I’m in the mood for. Can anyone else relate?? Thank you Recipe Redux for forcing me to search for the best long-lost ingredients for my sun dried tomato chicken and artichoke dish. I had a jar of Sun-dried tomatoes with herbs that had been in my pantry for a while (I believe for a layered cheese ball that I never made over the holidays) and a can of sliced black olives. There was also a half bottle of white wine left in the fridge from this past weekend (because I love to drink it), a spaghetti squash that I bought last week for the spaghetti sauce that I never made and a container of feta cheese that needed to be used. Preheat oven to 375 degrees F. Rub the flesh side of the spaghetti squash with olive oil and season with coarse salt. Place flesh-side-down on a baking sheet and cook for 35-45 minutes until flesh can be easily shredded with a fork. Spoon out seeds and discard. Keep squash flesh-side-down to keep warm while you prepare the chicken. Heat 2 tbsp olive oil in a dutch oven over medium heat. Add chicken and and cook until no longer pink and beginning to brown. Remove chicken from the pot and set aside. If there is any liquid remaining in the pan, drain well and add the remaining 2 tbsp olive oil. Add garlic and cook until lightly golden and fragrant, then add back chicken and the remaining ingredients. Cover and reduce heat to low. Simmer for 30 minutes to allow flavors to blend and liquid to be absorbed. 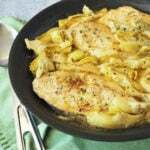 Shred squash into a large serving bowl and top with chicken and artichoke mixture. Garnish with feta and serve. Check out more “Spring Cleaning” creations, like my sun dried tomato chicken, from my RecipeRedux friends below! This is great! I needed a recipe to use up my sun dried tomatoes!! Thanks for sharing! It sounds lovely. I do the same thing all the time and intend to use up ingredients I’ve got but then I get tempted by new ideas that I just have to buy the ingredients for! I made spaghetti squash once and it was amazing! I have got to make it more often 🙂 And top it with sun-dried tomatoes and chicken!! I totally cook to taste too! (: And I think my tastebuds will love this dish Amee. Oh no!! I can’t believe that I messed that up, Serena! 🙁 Thank you for noticing and letting me know! 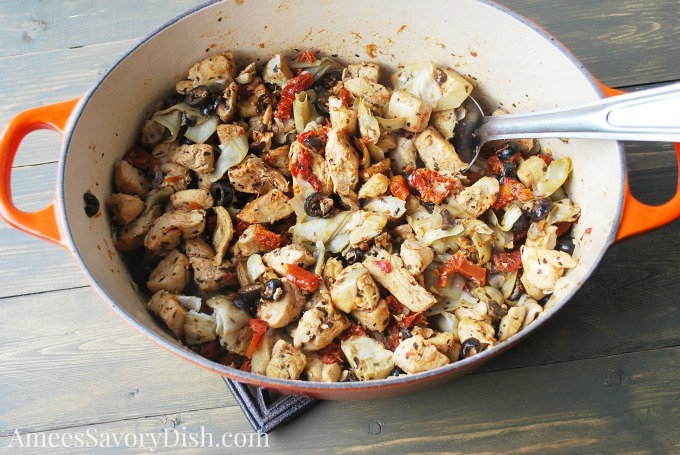 Sun-dried tomatoes, artichokes, and chicken pair so nicely. 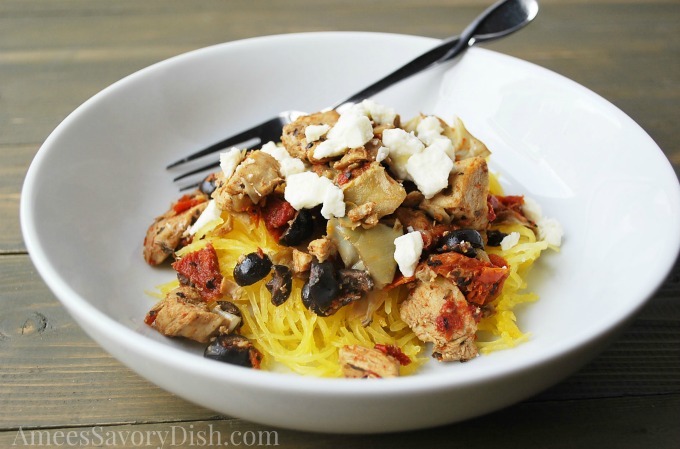 Love that you threw this over spaghetti squash! You’ve included almost all of my favorite ingredients in this recipe- this is a must try!